FILE - Muhammad Ali speaks to Muslims holding a book called "Towards Understanding Islam" written by Sayyid Abul Ala Maududi in London, Britain, May 1966. Ali died late Friday in Phoenix, Arizona, June 3, 2016. In 1964, Cassius Marcellus Clay Jr. changed his name to Muhammad Ali to reflect the growing influence of his Muslim faith on his life. Ali was one of the most high-profile Americans at the time to convert from Christianity to Islam, which caused quite a controversy, but over the years his relationship with his faith changed quite dramatically. Ali later said he embraced the Islamic religion because it gave him the chance to be free, and to feel a racial pride he said he couldn’t as a Christian. "Cassius Clay is a slave name," he once said. "I didn't choose it and I don't want it. I am Muhammad Ali, a free name — it means 'beloved of God' — and I insist people use it when people speak to me and of me." Ali traveled across the country as an up-and-coming boxer, where he came into contact with preachers from the Nation of Islam (NOI), an Islamic religious movement in the United States that has called for a separation between the black and white races. 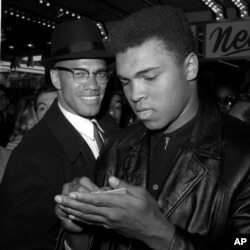 FILE - World heavyweight boxing champion Muhammad Ali, right, and Black Muslim leader Malcolm X in New York City, March 1, 1964. Ali died Friday in Phoenix, Arizona, at age 74. His friendship with Malcolm X, who was at the time a leading spokesman for the NOI, gave him access to the inner circle of the group and further drew him toward its radical teachings. Ali’s involvement with the group created a rift between him and many of his white and more moderate black fans who viewed the NOI as a hateful religion. Most journalists refused to address Ali by his new, chosen name, and former opponent Floyd Patterson said of Ali that the "image of a black Muslim as the world heavyweight champion disgraces the sport and the nation." 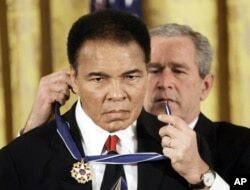 Despite the criticism, Ali held fast to his beliefs and denied claims they were but a fleeting interest. "A rooster crows only when it sees the light," he once told reporters regarding his faith. "Put him in the dark, and he'll never crow. I have seen the light, and I'm crowing." In 1967, just three years after his conversion, Ali used his newly found religious beliefs as a basis to resist being drafted into the U.S. Army for service in the Vietnam War. Ali refused to serve, claiming conscientious objector status, and was arrested in Houston, Texas, after he repeatedly refused induction into the armed forces. FILE - Heavyweight boxing champion Muhammad Ali is escorted from the Armed Forces Examining and Entrance Station in Houston by Lt. Col. J. Edwin McKee, after Ali refused Army induction, April 28, 1967. Ali died at age 74, June 3, 2016. "War is against the teachings of the Holy Quran. I'm not trying to dodge the draft. We are not supposed to take part in no wars unless declared by Allah or The Messenger. We don't take part in Christian wars or wars of any unbelievers,” he famously said. 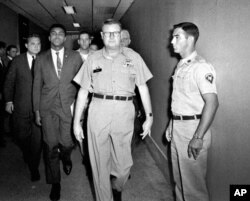 About a month later, Ali was convicted of a felony for refusing induction into the military. He went through several years of court cases and appeals before the Supreme Court finally overturned the conviction on grounds that it did not actually provide a reason for the denial of his conscientious objector exemption. It wasn’t until nearly a decade later in 1975 that Ali left the NOI and denounced the teachings of his former peers in favor of the more mainstream Sunni Islam sect. "The Nation of Islam taught that white people were devils. I don't believe that now; in fact, I never really believed that,” Ali wrote in a 2004 biography. “But when I was young, I had seen and heard so many horrible stories about the white man that this made me stop and listen." Later in his life, Ali converted again and came to embrace Sufi Islam after reading a collection of books by the sect’s founder, Hazrat Inayat Khan. In a 2005 interview, Ali’s daughter, Hana Yasmeen Ali, said that toward the end of her dad’s life, he moved away from the staunchly religious ways of his youth, and instead became more interested in his own spirituality. “His health and his spirituality have changed, and it's not so much about being religious, but about going out and making people happy, doing charity, and supporting people and causes,” she said. Still, as recently as last December, the always outspoken Ali voiced concerns about what he viewed as a threat to Islam from U.S. Republican presidential candidate Donald Trump, who has proposed a temporary ban on Muslims migrating to America. “They have alienated many from learning about Islam. True Muslims know or should know that it goes against our religion to try and force Islam on anybody,” he said in the short statement.